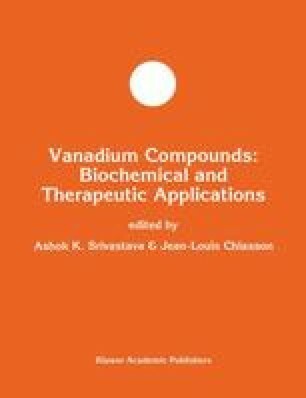 Vanadium (V) is an orally effective treatment for diabetes, but relatively little is known about the mechanisms controlling its normal metabolism nor the long term pharmacokinetics of oral administration. We have examined the accumulation of V in various organs from rats fed liquid diet for up to 18 days, containing no additional V, 1.6, 80, or 160 µmole/kg/day as either sodium orthovanadate (SOV) or vanadyl sulfate (VS). V content was assayed using a sensitive neutron activation analysis method. The organs of the nonsupplemented animals contained widely varying concentrations (ng of V/g dry tissue weight) with brain < fat < blood < heart < muscle < lung < liver < testes < spleen < kidney. All organs accumulated V in a dose dependent manner. Not all organs showed steady state amount of V at 18 days, so additional rats were fed SOV or VS, switched to control diet, and assayed at 0,4 and 8 days. From this data we calculated organ half lives of V Insulin sensitive tissue tissues, such as liver and fat, had shorter half-lives than tissues that are relatively less insulin sensitive, such as spleen, brain and testes. SOV and VS fed rats showed similar patterns, but VS had somewhat shorter t1/2’s. Additional studies of old and young rats fed control diet for 45 days show accumulation of V in spleen and testes. These results indicate that vanadium metabolism varies widely among different organs, and that insulin, either directly or indirectly has effects on the retention of vanadium. This may have impact on the therapeutic use of vanadium in Type I diabetics with no insulin, or Type II patients who may be relatively hyperinsulinemic.